Of course Verizon had to make the service as obtuse and difficult to use as possible. How hard is it to just sell the sim cards via website? Draconian and ikesmasher like this. Im actually a fan of limited download speeds to 5mpbs and 480p video instead of throttling people after a certain cap. the general public doesnt need much more than that. Agreed, I'd rather buy faster bandwidth then more data. OTOH, cricket offers 8 Mbps for a similar price without shenanigans to sign up for it. wiyosaya and Slappy McPhee like this. Its $60, or $55 with autopay. That is not a "similar price". $40 is much more appealing than paying $60 (some people wont use autopay, or cannot). Crickets cheaper unlimited plan is $55 or $50 with autopay but its only 3 mbps. This Verizon offering is honestly much more lucrative. It is absolutely a better deal than any Cricket offering and you get the use what is arguably the best and most reliable network in the US. $15-20/month is a big deal. Especially, with the industry leaving contracts behind, you have to take into account the cost of the phone. Whether you pay for it at once, or monthly, it still costs another ~$15-30/month over 2 years. Before you know it, discount plans can get expensive! Seemingly small costs add up. The big question is if either plan includes the taxes/fees. That's a decent chunk of change. Metro PCS is like 50-60$ a month and although it says it throttles data at a certain points iv never had problems watching videos in 1080p after going over my limit. I'll pass, not because of the value or that I am Android Developer and I already have Android cell and on $60 unlimited everything contract plan with leased phones from T-Mobile..
A great plan for the elderly. They would likely need some help setting it, but it ticks all the boxes. As for the cost of the phones, there is a healthy refurbish market. It so happens there is another article after this one that will help you find those refurbished deals. Cricket prices includes taxes/fees. Dont know about verizon, but given my past experiences with them, I'm gonna hazrd a firm "no". Netowkr reliability depends entirely on location. My work phone is verizon, my personal is cricket, and my personal phone gets better overall signal, especially in buildings. Verizon works, but it is typically a lower signal strength, and there are some areas where no signal is present for big red. The cricket plans seem more expensive, but while Verizon claims "$40 a month" I'll bet the actual cost is higher, between taxes, fees, "service charges", and other BS Verizon throws on plans, not to mention device compatibility. 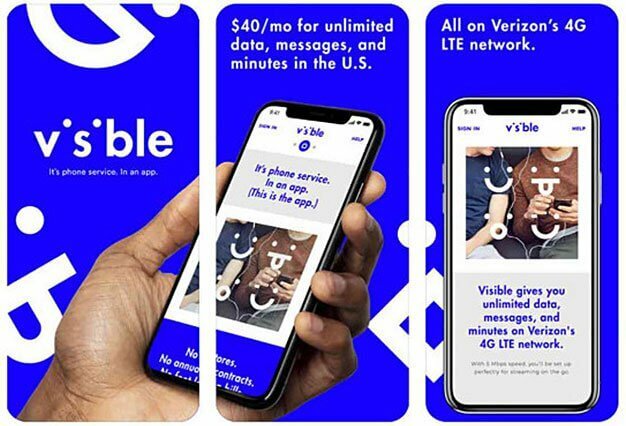 Verizon is notoriously stingy on devices that can be put on their network, and it wouldnt surprise me if they end up forcing you to buy one of their devices to use visible wireless.